November 25, 1953 was a watershed moment for English football, though they have had it coming. Not before and not since have England’s lack of technical ability and tactical backwardness been more exposed on as big a stage as Wembley in the game against Hungary. It is more than 60 years ago that England had to admit that the world had caught up if not even left them, the mother country of modern football, the cradle of the game, behind; and not just by small margin but some distance. It has become by now common knowledge that this game has changed English football – if for the better is open to debate. What is certain now, is that the defeat against the ‘Magical Magyars’ has resulted in England becoming World Champions on home soil just 13 years later. As a result, the game in November 1953 has become the 2nd most talked about game in English soccer history. So much so, that the Daily Mirror put ‘Twilight of the Soccer Gods’ on its front page, yet Peter Wilson remained defiant in claiming that ‘our best is not good enough for the best of the rest.’ The best of the rest? Peter Wilson, the man who could not be gagged, clearly had no knowledge about the state of the game in Europe and South America, the other epicentre of football. Within a month the England team had to endure 2 severe shocks to the system. While the first was seen as an aberration, the second was a revelation. How long does it take to lose a match? David Goldblatt asked, 45 seconds he answered. Or rather Hungary answered: it took less than a minute for them to carve open the English defence and for Nandor Hidegkuti to score the opener from just outside the England penalty area. Hungary scored 5 more within 55 minutes, England managed to score 3. However, the result does not reflect the true dimension of the defeat. The video highlights of British Pathé show how effortless the Hungarian passed their way through the English defence. The comments offered by Kenneth Wolstenholme are equally revealing. 14.14: England, then, defending the goal to our right, and now there’s an exhibition of ball control. Just look at that from the inside left, Puskas. Well, we see a great deal of that, I think we’re gonna have an awful lot of trouble holding these unbeaten Hungarians. 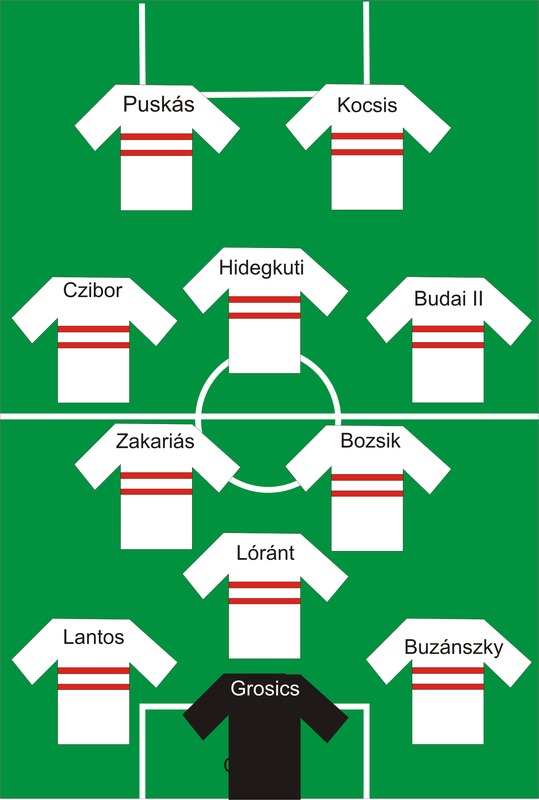 Lined up in their usual formation, with a front ﬁve of Budai, Kocsis, Hidegkuti, Puskás and Czibor. 14.54: And that was Puskas, the inside left and captain, who scored that one, and my goodness, if he can turn on tricks like this, we ought to have him on the music hall. I’ve never seen such tremendous ball control as that exhibition of that back-heel and the quick shot. 3-1, then, for Hungary. 14.57: Well, before the game, everybody was telling me that it was a lot of ballyhoo about these Hungarians, England would win. Well, here we are, 27 minutes gone, 4-1 down. 15.36: They seem to play football as the Harlem Globetrotters play basketball, this Hungarian side. 16.02: So that’s it. Six goals to three, all the goals coming within the hour. An expectant crowd of over 100,000 has been shell-shocked today. England looked to be rallying when Mortensen got the score to 42 but Puskas, the Galloping Major they call him, and I can see why, pranced through the England defence all afternoon, and Hidegkuti scored three. England’s long and illustrious home unbeaten run against non-UK opposition has come to a sudden end. These Mighty Magyars have sent shivers down the spines of so many footballing nations here. Similarly, George Robb who has played that day in defence for England argued that Hungary were a very good side and that the result brought everyone down to earth. The result meant that England had a bit to do and that standstill would essentially be lethal. The German journalist Gottfried Weise stated that after the game the modern era of football could begin. He referred mostly to Nandor Hidegkuti whose role as a deep lying centre forward made the traditional WM-formation used by England obsolete. This is only partly true. Certainly, England played a rigid system and the match made the deficiencies of the system as well as English players look out dated. The game in Hungary and Europe as a whole appeared to have advanced further than it was the case in England. Therefore to state that only after England had witnessed it first hand, the football modernity was about to start, is a somewhat bold claim. Rather, England were shown that they were out of touch with reality in football terms. Weise’s point of view seems to be based on England being the navel of world football and does not reflect the state of the game outside England. Hogan himself stated that Budapest was for him the most beautiful city in Europe and the 21 years spent in Austria, Hungary and Germany were the happiest and most successful years he enjoyed as a coach. It filled him with pride to see these 3 countries being the top 3 at the World Cup 1954. The football played by Hungary in 1953 was of Scottish origin, taught by Jimmy Hogan in Vienna and Budapest to willing students of the game. One of them was Gustav Szebes. Of course coaching was not alone the cause for Hungary’s triumph. In the late 1940s Ferenc Puskas emerged and soon became a house hold name in Hungarian football circles. The team of Szebes were unbeaten between 1950 and 1954, a total of 24 games. After the defeat against Germany in the World Cup Final, the Aranycsapat were again unbeaten for 2 more years, totalling 42 victories, 7 draws and only 1 defeat in 6 years. Though it was only in 1952 in Helsinki when they won the Olympic gold medal in the football tournament, that the wider football public took note of the them. The violent end of the revolution in 1956 also meant the end for the Golden Team. 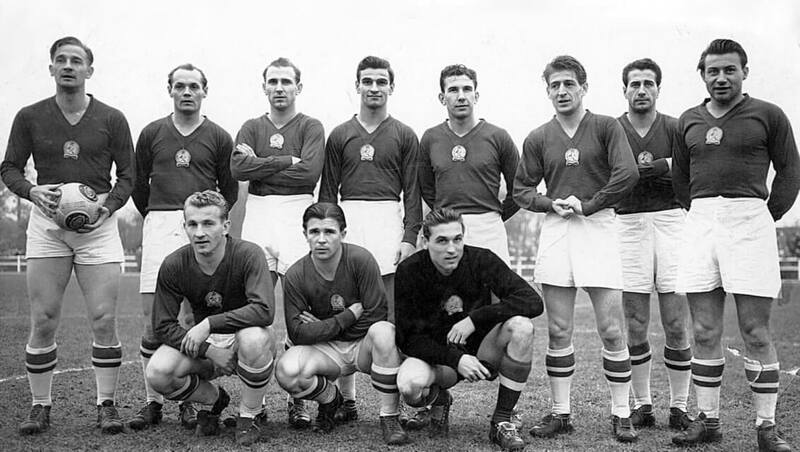 Puskas went to Madrid, Kocsis and Czibor signed for Barcelona. As much as the football public was stunned to see England humbled by such a margin by a team that they did not know, as much it is a surprise that it has taken so long for the writing on the wall for England to be read and more importantly be understood. It was a revolution in football but only from their point of view. Any one with a slight interest in football outside the British Isles would have known the coffee house football of Austria in the late 1920s and early 1930s and its Hungarian successor emerging in the late 1940s. The revolution was very much born in Britain, in Scotland precisely as the Scots invented a passing game to be different from the English. Jimmy Hogan, born in Burnley of Irish descent preferred the Scottish way of playing and after personal disappointment with the decision makers within the English game decided to teach football in Central Europe instead. Almost 40 years after being snubbed by FA secretary Frederick Wall, he reaped the rewards of his work. England suffered further humiliation in the return game in Budapest in May 1954. The result, 7-1 highlighted that England had not learned a thing from Wembley. At the World Cup they were defeated 3-2 by holders Uruguay. Some credibility was restored by beating the world champions West Germany at Wembley in December 1954. Jonathan Wilson, Inverting the Pyramid: The History of Football Tactics (London: Orion Books, 2009). Jonathan Wilson, The Anatomy of England: A History in Ten Matches (London: Orion Books, 2010). Ronald Kowalski; Dilwyn Porter, England’s World Turned Upside Down? Magical Magyars and British Football, Sport in History, Vol. 23, issue 2, 2003, pp. 27-46.
image credit: © 2008, Pilise Gábor.© 2008, Pilise Gábor.